Fixed annuities are the comfortable shoes of annuities. Their comfort comes from their simplicity and predictability. They may be a little boring, compared to variable annuities, but they don’t carry the risks, either. Fixed annuities are the simplest and most straightforward type of annuities. They also provide the most predictable and reliable income stream, usually with the lowest fees. Like any annuities, fixed annuities are contracts between a purchaser and an annuity provider, usually an insurance company. A fixed annuity can be immediate or deferred. That is, depending on your contract, you may start receiving annuity payments within a year of purchasing your fixed annuity or you may have the payments start at a later time. Deferred annuities typically start payments at retirement. In deciding whether a fixed annuity is right for you, you should consider how it works and how it compared with other types of annuities. A fixed annuity is a contract between you and an insurance provider. A fixed annuity provides a way to save money over the long term, allowing interest to accumulate tax deferred. You pay for a steady stream of income. The insurance company guarantees your principal and a minimum interest rate. How the money in your fixed annuity grows will be spelled out in your contract. It may be by a set dollar amount, an interest rate or by another formula specified in the contract. Unlike variable annuities and indexed annuities, fixed annuities are not linked to the performance of a portfolio or another investment. Different annuity providers offer different ways to save under different rules. Providers also vary in the charges they levy and restrictions they place on annuities. Income payments from a fixed annuity can be guaranteed for life or for a set number of years, depending on the terms of the contract specifying the annuity payout options. You may also elect to receive it in a lump sum. This is known as a multi-year guaranteed annuity. (MYGA). With any investment, it’s wise to consider the pros and cons before deciding which choice is right for you. Simple: Unlike variable and indexed annuities, fixed annuities have no complicated formulas for determining the amount of money you will receive in income payments. The rates and any changes are spelled out in the annuity contract. Predictable: Since everything is agreed on in the contract, you know what to expect. You don’t have to worry about whether an investment portfolio or the stock market are performing well. The interest rate is spelled out and guaranteed in the contract. Lowest risk: Since the interest is not dependent on the performance of investments or stocks, you don’t have to worry about losing money when stocks and other investments do badly. This is especially important for retirees, who can’t afford to lose the money they need to pay living expenses. No frills: The main disadvantage is fixed annuities do not have the potential that riskier annuities have of yielding greater interest rates if an investment portfolio or stock index does well. No inflation hedge: Growth is fixed and may not keep up with inflation. That means their actual value may decline over time. No capital gains tax rates: Money withdrawn from annuities is taxed as ordinary income. It does not get the benefit of lower capital gains rates. Penalties for early withdrawals: If you try to withdraw money from a fixed annuity, or any annuity, before you are 59 ½, you will pay an IRS penalty. Surrender charges: If you don’t like the interest rates when they are reset, you can face hefty surrender penalties if you want to withdraw your money early. What are the pros and cons of a fixed annuity? 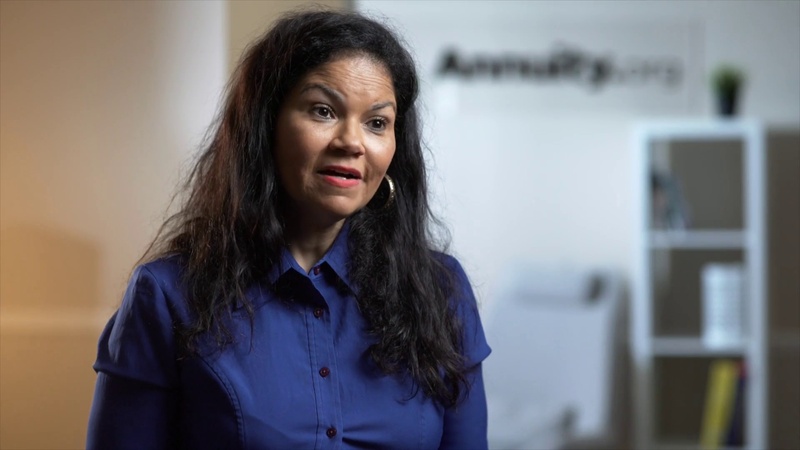 Learn about the pros and cons of a fixed annuity from financial expert Juliette Fairley. When funds are building through interest or deposits — before payments begin — the annuity is in what is referred to as the accumulation phase. During the accumulation phase of a fixed annuity, the current interest rate is applied. This annuity rate is guaranteed for that time period. The insurance company usually sets the rate based on its own investment portfolio. After the end of the set time period, another interest rate, known as the renewal rate, kicks in. The contract will spell out how the renewal rate will be established. Some fixed-annuity contracts provide a higher interest rate at the beginning, known as the bonus rate. Your fixed annuity contract will include a minimum guaranteed rate. The guarantee from the annuity company is that the interest on your fixed annuity will not dip below that rate. The company also guarantees the principal investment. Overall, annuity funds are not guaranteed by the Federal Deposit Insurance Corporation or any other federal insurance agency. They are regulated and guaranteed by state insurance commissions. Fixed annuities are different from variable annuities in how the interest rates are set. With fixed annuities, interest rates are spelled out in the contract ahead of time, based on what the annuity provider thinks it will make in its investments. With variable annuities, interest is tied to the performance of an investment portfolio. Interest set at outset of the contract Interest linked to performance of index, such as S&P 500. Guaranteed not to go below a certain level.